Brace yourself Cardiff, there is the mother of all parties heading your way. You can read Tom Fordyce's match report from cloud-nine Principality Stadium here. If you want to see how England and Scotland are getting on, step this way for a Calcutta Cup dead rubber. 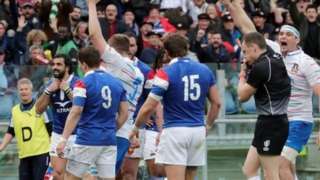 France round off their disappointing Six Nations campaign with an unconvincing win over Italy in Rome. "Wales had a cracking start. They bult into the game. They're a very determinded side and hard to beat here. "We couldn’t get footing in the game. Our set-piece wasn’t up to the standard that we expect. They put a lot of pressure on us and we struggled to respond. "It’s been a very competitive Six Nations. We have to go and address why we lost. We've been inconsintent this championship and we'll have to dust ourselves off and finish the calendar year strong. "We can talk about the aftermath of this later on you have to give credit to Wales - they're deserved Grand Slam winners." Tony: Gotta be a knighthood for Gats and awards for the rest of the coaching teams. Awesome. Dani: HELL YEAH WALES!!! I'm so proud of the boys! GRAND SLAM CHAMPIONS 2019!!! CYMRU AM BYTH!!! Neil Humphries: I don’t know how to do it, but if someone can set up a crowdfunding page to keep Gatland, Edwards and co forever, I’ll be your first donation. Wales have got strength in depth. Remarkably we've done this without Taulupe Faletau. Wales have got belief but a bit of a dampener is that if you look at the last two World Cups, the teams who have won the Six Nations have tanked it in the World Cup - Ireland in 2015 and England in 2011. But there will be a lot of belief for Wales now. Hadleigh Parkes, who scored Wales' try, tells BBC One: "The crowd has been amazing, we're really enjoying ourselves, and to do it like that is amazing. "Everyone is good mates and wants to work hard for each other and you can see that in the defence when everyone puts their bodies on the line. "We'll enjoy the celebrations for a while. They'll be awesome." "We're just trying to slip under the radar. We know on our day that we're capable of beating good teams so I think we'll have a break now and start preparing for the World Cup. "These boys will run through a brick wall for you. They're a really tight group and really close to each other. If we go there with a bit of luck and not too many injuries we've got a good chance of beating anybody." "It was a fantastic performance, we didn’t look too tired did we? "We spoke beforehand about the players playing for themselves, their families and the fans and being able to create a bit of history. You can never take that away from them now. "I said if we won the first game against France we've got a good chance of winning the whole thing. If that creates that bit of belief in the players then maybe something like this can happen. "Alun Wyn Jones has really matured as a player. He's done a great job of leading the team in this campaign. He's tough, he's resilient and he deserves all the adulation he gets." The commemorative Grand Slam t-shirts were printed up and kept on the down-low, but they have now been unboxed and thrown over every Wales player. Delilah belts out over the tannoy as friends and families are picked out for blown kisses. "It's hard to put into words what this means, we've worked incredibly hard over the last year. We have a habit of winning. It's a special group and we worked hard for each other. "We wanted to enjoy it. We're in the best stadium in the world in front of our people and we wanted to take the game to them. "It hasn't all been smooth sailing. For me it's a day and weekend to remember for Welsh rugby. "The celebrations will be a couple of days I think. I don't know if I'll go to training on Monday. I'll have to ask the coach." 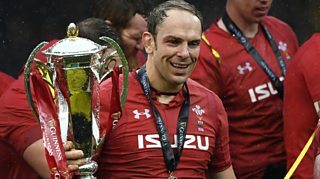 The Wales team are called up one-by-one to collect their medals with the last gong and shout-out saved for the man who gets the loudest reception: Alun Wyn Jones. The Six Nations trophy and the Triple Crown are hoisted into the sky, quickly followed by red and gold tickertape and flares of flame. Champagne splatters and spittle flies as the players roar in elation. That Wales defence smothered England and it's smothered Ireland again today. They are so hard to beat in physical battles. "Anything can happen when you work hard and you're a proud nation and we've shown that. "Warren's the man at the top and we've been under pressure but he's always been unwavering. He's got a bit left on his contract but I'm sure we'll miss him when he's eventually gone. "At times we've been unconvincing so we like to think there's still potential in us. We're well aware we've just put a big target on our backs before the World Cup." That's an amazing victory. Wales have been too good over the past five years not to win a title. There have been some ups and downs but to beat ireland, the second best team in the world, is phenomenal and I'm so happy for all those involved. An absolutely HUGE roar from the home fans as Alun Wyn Jones appears on the big screen for his post-match interview. The man is a colossus, a bona fide Welsh legend. Warren Gatland is exchanging rib-crushing bearhugs with his backroom staff and is roared to the rafters when he appears on the big screen. Gareth Anscombe speaks well, admitting that "it has not all been plain sailing for me personally" but praising "a great group who work hard for each other". Rory Best is gracious saying that this is not the time of World Cup predictions, but time to give credit to Wales. Credit Ireland for keeping going right up to the final whistle but there was only one team playing out there today and that was the one in red. There's way to lose games and Ireland lost badly today. They were beaten all ends up and I can't think of one facet of the game where they held their own. It's a really disappointing day for Irish rugby but there is a World Cup coming up so they will have to recover from this quickly. For me, this was going to be the toughest game and to win with that margin says it all. How this side has matured, they looked composed and in control. 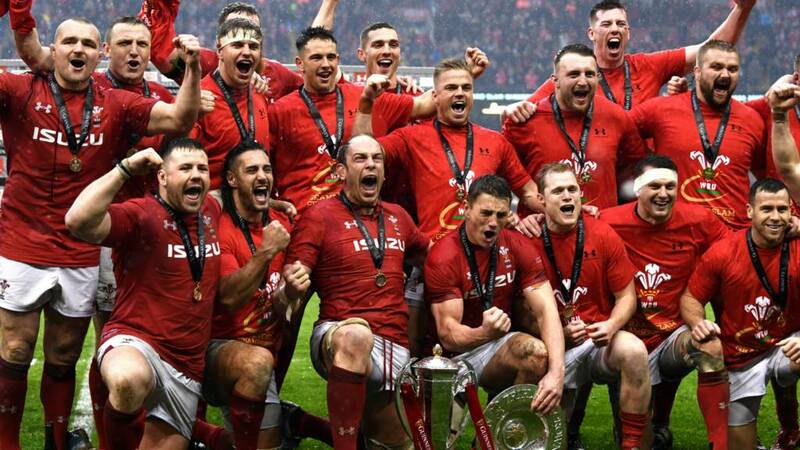 It's been a brilliant Six Nations and Wales are in a very good place to go to the World Cup. It has been a brilliant campaign by Wales. Not spectacular, but utterly ruthless and when it mattered they rose to the occasion. They have finished their Grand Slam campaign in some style.